Being a dance mom requires hours and hours spent in the car driving from one venue to the other for performances, practices, and meetings. When your dancer or dancer’s siblings are young, that can mean some inevitable meltdowns. If that sounds like your Dance Mom, then she needs this Children’s Travel Tray to entertain the little ones on the road. Dance Moms are busy, especially around Christmas time. That means little time to brew her own coffee or even stop by Starbucks when she’s got a car full of mini ballerinas. These Cold Brew Concentrates is the answer to all of her caffeine problems. Each bottle provides 8-10 servings of deliciously smooth, light-bodied iced coffee. Sometimes a Dance Mom’s role can feel like that of a traveling secretary. She has calendars to update, emails to manage, music to download, and pictures to take- all on a phone that must be charged! This Portable Phone Charger will ensure that mom’s day-to-day will always go smoothly and she’ll never miss a beat. Mom might be too old for a twirling ballerina jewelry box, but certainly not too old for this artistic ballerina jewelry stand. Alone, this jewelry stand makes for a beautiful dresser top embellishment. Hang a ring or two along with a necklace, and she’s got the most beautiful way to organize her jewelry. While your Dance mom sits in the stands all day waiting for her dancers to come on stage, she can brainstorm dance ideas, write down her grocery list, or record anything that pops into her head with this Smart Notebook. As she does so, all her notes are uploaded into the cloud where she can revisit them on her phone or computer later. Most people don’t realize how much gear a dance mom has to lug around. Between makeup, hair spray, tap shoes, costume changes and water bottles, every Dance Mom’s bag eventually gets too heavy to carry. If you want to get her a really useful Christmas gift this year, consider the Stair Stepping Smarter Cart which that lessen the load. Days at the dance studio are often long and exhausting. Dance Moms know how important it is to always have snacks on hand for their hard-working kids. This Canvas Lunch Bag Tote is so cute that you wouldn’t even know it is also an insulated cooler to store sandwiches, drinks and more. A Dance Mom’s sewing station is sacred! With all the chaos of dance schedules, she needs to have a place that is organized and serene. This beautiful, stoneware sewing station, handmade in Florida, makes storing and accessing her sewing kit a breeze. She’ll love this unique stoneware spool that even comes with a pincushion. Dance Moms on-the-go put a lot of time and energy into their daughter’s hair, but often don’t have a second to spend on their own hair! This collection of 10 wide headbands in an array of solid colors is the perfect quick fix to have a gorgeous hair day. When mom opens this gift on Christmas, she is going to be tempted to slip it on immediately. This Dance Mom Slouchy Oversized Sweatshirt is magic. In essence, its just a baggy sweatshirt, but it somehow looks good on every mom. This is the best get-up-and-go outfit that she can wear day in and day out. In order to get your Dance Mom that perfect Christmas gift this year, you have to think about what she needs. Dance Moms are the queens of carrying emergency snacks, backup pairs of tights, a book to read, and all the contents of her purse. Mom needs this Canvas Bag! Order it with a big, pink ‘M’ for mom and she’ll absolutely love it. To show your Dance Mom how much you appreciate all of the effort she has spent towards her littler dancer’s dreams, give her something beautiful this Christmas. This Dance Mom Dangle Charm Bracelet will be the perfect reminder for mom every time she puts it on. A great way for mom to keep herself organized during the week while making sure the whole family is on the same page is with this Magnetic Refrigerator Monthly Calendar. With a dry erase pen, she can update and revise the dance family’s weekly schedule to add a little method to the madness. As a Dance Mom, it can be difficult to find time to put yourself first. Sometimes that means that her health can take a back seat. This Christmas, give mom this Fruit Infused Water Bottle that will make staying hydrated deliciously easy. Her water will not only taste fruity, but she will also get an extra kick of vitamins. It’s no secret that Dance Moms have a busy schedule. Keeping track of the time is extremely important and the entire day depends on it. Any Dance Mom would be delighted to open her gift on Christmas morning to find this gorgeous rose gold Michael Kors watch. It’s beautiful, top quality, and will last her for many dance seasons to come. Being fashionable and comfortable is of the utmost importance when you are a Dance Mom. You want to look cute standing alongside all of the other dance moms, but still able to move flexibly while carrying outfits, bags, and children. This Turtleneck Knitted Poncho is the perfect outfit for exactly that. Imagine spending all morning styling your daughters hair with curling irons, pins, and hairspray, just to be met with a downpour of rain once you reach the dance hall. What a nightmare! Luckily, with The World’s Smallest Automatic Umbrella stashed away in mom’s glove box, any hair disaster is completely unavoidable. Dance Moms are always helping their child improve practice after practice. 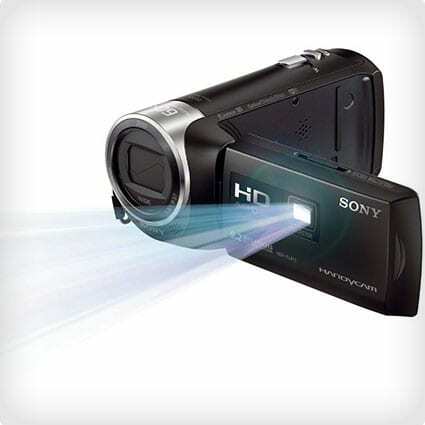 This Sony Camcorder will give mom the ability to record practices in HD, and then with the built-in projector, review them with her talented dancer afterwards. The image stabilization makes this camera ideal of fast-paced dance videos and produces clear images every time. Being a Dance Mom isn’t an easy job! In fact, it can be downright stressful. After a full week of dance practices, performances and shopping trips, Mom deserves to unwind! Give her this 6-pack of Red Wine for Christmas and you will become an instant hero. There is nothing quite like a spicy red blend to take the edge off. This Christmas, give your Dance Mom a gift to make her feel included. These easy-to-make crochet leg warmers will make her feel like an honorary dancer around the house. Choose her favorite color and get to work. Her heart is going to be so warmed knowing that you put in all this effort just for her. Your mom may not be the dancer in the family, but these years of dance for her children are going to be memories she will treasure for the rest of her days. By handmaking her this whimsical Paper Ballerina Ornament, you will be giving her a token to reflect back on these years every Christmas season. Does your Dance Mom have a favorite lyrical song? If so, this is the perfect opportunity to make her a special Christmas gift that she will never forget. Start with a sheet of that music, select an aesthetically appealing bar, and modge podge your way to jewelry innovation by following this easy tutorial. You don’t have to be a fantastic artist to pull this Ballerina Painting off. This helpful DIY guide will help you create a simple, yet totally magical masterpiece. Using a canvas, some paint, and a few strips of fabric, you will have created the ultimate Dancer Mom Christmas Gift. Have fun with it and make it your own!